[caption id="attachment_6660" align="alignnone" width="300" caption="Super Bowl Live Shot from USS Harry S. Truman"] [/caption] If you tuned into the Super Bowl to watch those Saints whoop up on the overrated Colts, chances are you saw a few elements shot by GTT’s Richmond, VA based HD video crew. 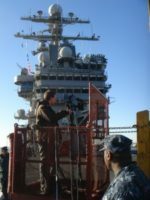 CBS wanted to showcase the service men and women on the USS Harry S. Truman outside of Norfolk, VA. 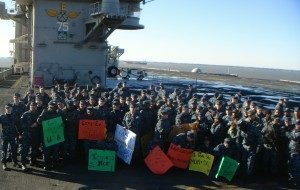 The troops played a quick flag football game in one of the ship’s massive hangers and they also participated in a few large group live shots. Some of the material aired during the six-hour pregame show and some during Queen Latifah’s rendition of “America the Beautiful.” The Mid-Atlantic HD video crew had always wanted to shoot for the big game and with New Orleans taking home the Vince Lombardi Trophy, it was a pretty amazing day. Geaux Saints! [caption id="attachment_6661" align="alignnone" width="225" caption="Nick Modisett on USS Harry S Truman for Super Bowl coverage"] [/caption] Check out the video here!